Combine bread crumbs with Parmesan cheese in shallow dish; set aside. Add chicken and mayonnaise to large plastic bag; shake to evenly coat. Remove chicken, then lightly coat in crumb mixture. Arrange chicken on baking sheet. Bake 20 minutes. 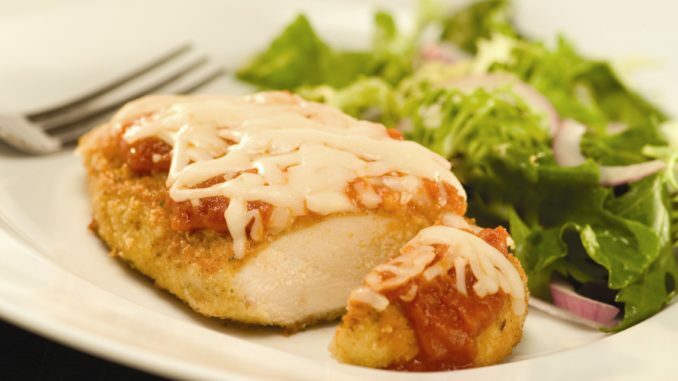 Evenly top chicken with pasta sauce, then mozzarella cheese. Bake an additional 3 minutes or until chicken is thoroughly cooked and cheese is melted.